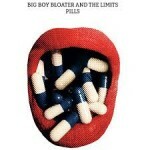 Share the post "Album review: BIG BOY BLOATER AND THE LIMITS – Pills"
Big Boy Bloater And The Limits new CD ‘Pills’ strips things down to the bone in a power trio format, with Bloater on guitar and lead vocals, Matt Cowley on drums and bv’s, bassist Steve Oates also on bv’s, and a significant but unknown female backing vocalist who smooths over Bloater’s rough edges. ‘Pills’ find him digging deep into his r&b antecedents topped by some belligerent riff- driven roots rocking blues. He’s a limited singer who could do with a touch more subtly in his phrasing, but he has enough lyrical depth, musical acumen and soulful feel to engage us. It’s an album with a significant title track that conveys a meaningful message in a humorous way. The title track’s subject matter – society’s over reliance on medication – isn’t really a conceptual corner stone of the album, but the following 11 tracks do feel like musical repost to a homogenized corporate ideal. As always, Big Boy Bloater mixes up his own life experiences with fictive narratives to evaluate bigger questions about himself and all of us, but he always does so in a wry and humorous fashion. The album is full musical variety. It rocks hard in places and sometimes it’s autobiographical, while laying down some poignant social observations in the form of little narratives that cast Bloater as a chronicler of our times. ‘Pills’ is built on an eclectic dynamic full of different musical styles and contrasting humorous and dark stories, and Bloater saves his best moments for when he unexpectedly reaches back to the 70′s on a handful of outstanding tracks. ‘Friday Night’s Alright For Drinking’ for example, evokes the drive of Mott The Hoople and the vivacity of Elton John, on a piece lacking only a piano to fully make the connection between the two. A slide guitar intro and archetypal growled out lyrics lead into an uplifting memorable hook with a welcome harmony vocal and an insistent triangle. The subsequent drop-down makes room for an incisive hip shuffling solo over a walking bass line and a fat groove. He later employs a similar tension breaking solo on ‘The Digital Number Of The Beast’ with its binary coded hook about artifical intelligence. He’s equally impressive on ‘Oops Sorry’, a goodtime rocker that could be Rockpile, on a relationship break-up song. But just when you think you have his measure, he suddenly changes the mood with an acoustic pop song ‘Stop Stringing Me Along’, which takes a pop at agents. It only lacks the obligatory handclaps to complete the sing-along feel on a gentle arrangement with hard hitting lyrics. On ‘Mouse Organ’ he’s Tom Waits meet Howlin’ Wolf on a retro sounding track with an unexpected dobro and faux string arrangement. Bloater is consistently unpredictable. He always has a sense of fun, whimsy and eclecticism, as evidenced by his B-movie references, which again bubble up on the quasi paradoxical title of ‘Unnaturally Charming’. We’re straight into a clever electro intro with triple organ, guitar and a sax sounding riff. His hoarse voice cuts through a sparse backbeat that gives the funky influence plenty of room to percolate. Listening to the album back-to-back gives you the feeling of balance, if not contentment. Bloater is wary of the hegemony of over prescribed medication at the outset, though he quietly knows it’s value. He also takes a poke at societal mores, but is still very much part of it all. Then he’s into some gentle satire with ‘Slackers Paradise’ on which he fuses a Bowie ‘Young Americans’ era intro with a funky Ian Dury feel. His coarse uncompromising vocal is couched in harmony vocals and is counterweighted by a clean toned solo, which again evokes balance. This entry was posted in ALBUM REVIEWS, ALBUM REVIEWS (Mobile), All Posts, INTERVIEWS, Radio interview and tagged album, Big Boy Bloater And The Limits, blues, David Bowie, Elton John, funk, Howlin Wolf, Ian Dury, Matt Cowley, Mott the Hoople, R&B, review, rock, Rockpile, Steve Oates, Tom Waits. Bookmark the permalink.